Christina Swaan, your friendly Academic Technology Consultant, shares some great ideas for keeping safe! We do everything online these days - from work to leisure, banking, game-playing, and communicating with friends and family. Unfortunately, this has exposed our computers and our private data to some significant risks. In this issue I’d like to explain some easy ways that you can protect your computers and web-accessible devices from some of the dangerous threats that are lurking out there online. Spend enough time on the Internet and you’ve probably seen some pop=up somewhere that informed you of a virus or malware on your computer. Sometimes you may even get a message saying that your computer can be cleaned up if you download and install a free update or piece of software. Chances are, these pop-ups or warnings are actually viruses or malware trying to get onto your computer by tricking you into believing that you are doing the right thing by authorizing the software to install. 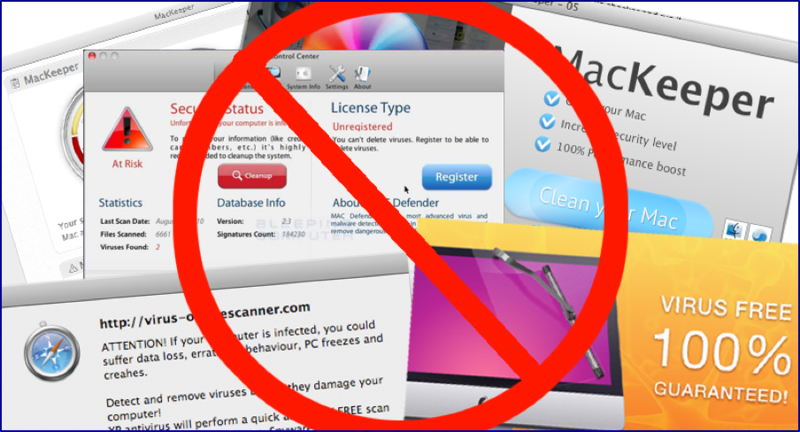 Some of the most common of pieces of these software go by official-sounding names such as “Clean my mac” or “Mac Keeper”. If you didn’t specifically choose to download and install that piece of software it is likely malware. Do not try to install something without consulting a technician. When in doubt, quit your browser. If a window or pop-up appears with which you aren’t familiar, close out of it – do not click continue, ok, or any other suggested buttons within the window. Doing so may download and install unwanted software. Avoid clicking on unusual links or websites posted on social media sites and within emails. Many social media sites allow third party sites to access data/settings from your browser. When presented with an option to do so, do not allow a site that you are unfamiliar with gain access to this information. Your iPhone, Android, iPad, tablet PC, or other mobile device is probably the piece of technology that spends the most time with you, and travels with you almost everywhere you go. Because of this, unfortunately these types of devices are the most at-risk of becoming compromised. You can make your devices a little bit more secure in several ways. Always enable the security lock password or numeric code on your device. If you accidentally misplace your phone or leave your mobile device unattended, enabling the password lock will prevent someone from easily picking it up and accessing your private information and settings. If your device allows it, enable fingerprint authentication. This will lock your device down so that only you have access to it, and if you have trouble remembering passwords this is a great way to add security without having to remember yet another code. Avoid connecting to free open wireless networks (this also applies to computers). Free and open wifi networks are all over the place – libraries, coffee shops, airports. Unfortunately, these unsecure wireless networks are prime locations for persons trying to collect private information such as passwords, logins, and other information that may be shared over the web. Sometimes, particularly creative thieves will use a mobile hotspot to create an open wireless network that uses a name similar to that of a legitimate secure network. Secure networks will always require a login password of some kind. If the network does not have a password, you may want to think twice before connecting. There is nearly an unlimited number of places where you can get information and support for technology. A simple Google search for drivers, support, or information can bring up many apparently helpful results and websites that appear to have exactly the information you need. BEWARE – things are not always as they seem! Tech support is a huge industry, and identity thieves and hackers have been quick to recognize this. Among some of the more common scams out there now are ones which feature fake tech support ads, websites, or support pages. These sites may contain a lot of helpful information, or direct you to contact a seemingly friendly tech-support agent. The reality is that these sites exist to try to get critical information from you so that they can gain access to your computer and private data. Avoiding these scams can be done if you practice just a little bit of caution. Here are a few tips how! Do NOT download drivers or updates from anywhere except the official manufacturer's web-site. Most devices and peripherals will have a tech-support site listed on the manual or user documentation that came with them, e.g. hp.com, dell.com. Never download a driver from a third party source. Do NOT reply to pop-up ads, or other web-based communications that ask you to talk to a tech support representative for services you did not specifically request to install. Do NOT give out your password. If you receive an email asking you to provide information such as passwords, private information, login information, or other data that is not related to something you requested it is most likely a scam. Do NOT provide your password to these types of communications. If a tech support representative calls you and you haven't requested support, it is a scam. If you’ve ever tried getting ahold of tech support for a major product company I’m sure you’re familiar with long wait times, and how difficult it is to reach a real person. Trust me, their tech support is NOT going to call you to let you know that there is a virus on your computer. If you didn’t ask them to call you, hang up the phone. This tip has gotten us all out of a bind in many cases! In Mac OS and Windows, it's always easy to save any document to a PDF. Here are some of the options to do so. ...continue reading "Tech Tips: Print to PDF in Mac OS and Windows"